Ah, the lovely journey of discovering how your dog feels about other dogs once they get comfortable in their environment. Our two months with Johnnie Cash have been interesting and informative, and I think we’re at a place where we pretty much know her feelings about other dogs and how to handle them. 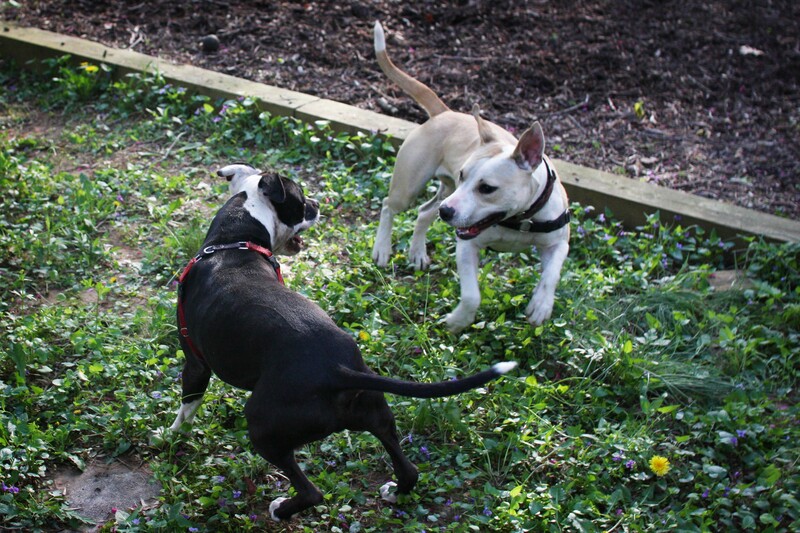 Johnnie was in a playgroup at the shelter and I took her on a playdate with one of her shelter buds the first day I brought her home, so I knew that even if some reactivity began to show, there’d be hope. Lots of dogs are reactive on leash because of the added stress, but can safely participate in playgroups. It’s all about knowing your own dog. So for the first few weeks of having Johnnie, I kept leash greetings to a minimum. I wanted to figure her out before I had to figure her and other dogs out. In the neighborhood we crossed the street when we saw other dogs and I worked on keeping her focus on me, not them. The first day I had her as a foster, playing with her BFF China. She did very well at this for a long time. Barking dogs in yards were nothing to her, especially if I had some string cheese, and passing other dogs on the street wasn’t too difficult. After about a month though, she started getting a little barky at adoption events. It wasn’t usually at particular dogs – meaning, she wasn’t being reactive in a way that is often interpreted as scary – it was more just in general, seemingly out of frustration or excitement. Then on walks it seemed like she was focusing on other dogs more. Operation prevent-the-reactive-foster-dog immediately went into action. I knew I needed to work on Johnnie’s feelings about other dogs before the frustration turned into reactivity or aggression. It was the incident of getting stuck at the cherry blossoms that helped me realize a few things: I have to be very mindful of Johnnie’s threshold, I can’t get too relaxed with training around other dogs and if I don’t manage situations around other dogs well, Johnnie has the capability to cause quite a scene. The major thing we work on is focus. Every walk we’ve taken since then, I’ve had treats and a clicker. To help Johnnie stay focused, I always make sure we are below her threshold around other dogs. This means we are at a far enough distance where she doesn’t feel the need to bark or try to get to them (usually it’s a playful trying to get to them – but if they react towards her, sometimes it’s a “get back” bark). We also always have high value treats. For Johnnie, string cheese usually does the trick, or sometimes hot dogs. Food is a primary reinforcer for dogs, so it’s very important and helpful to have that be your strongest tool. Dogs are often reactive for two reason: fear or excitement. It’s important to realize this when working with a reactive dog and know that they’re acting out because they’re uncomfortable. Also, it’s important to try to keep them out of situations where they feel the need to react. Every time a dog reacts, they reinforce themselves. It feels good – and, most of the time, it works because whatever is making them uncomfortable moves away. If it works so well, wouldn’t you keep doing it? So when staying below threshold, I click and treat Johnnie for just acknowledging the other dog and then looking away. I start with this and then build up to her acknowledging the other dog and then making eye contact with me. This way, it becomes her decision to look at a dog and then immediately look at me because it means treat time! This redirection helps her from getting too intently focused on the other dog – something that often leads to a reaction. It is actually helping her re-wire her emotional response to other dogs, instead of just nixing the symptoms and having her still feel uncomfortable around them. We usually practice it at a park or somewhere that I know there will be other dogs around but that we’ll also be able to stay a safe and comfortable distance from them. 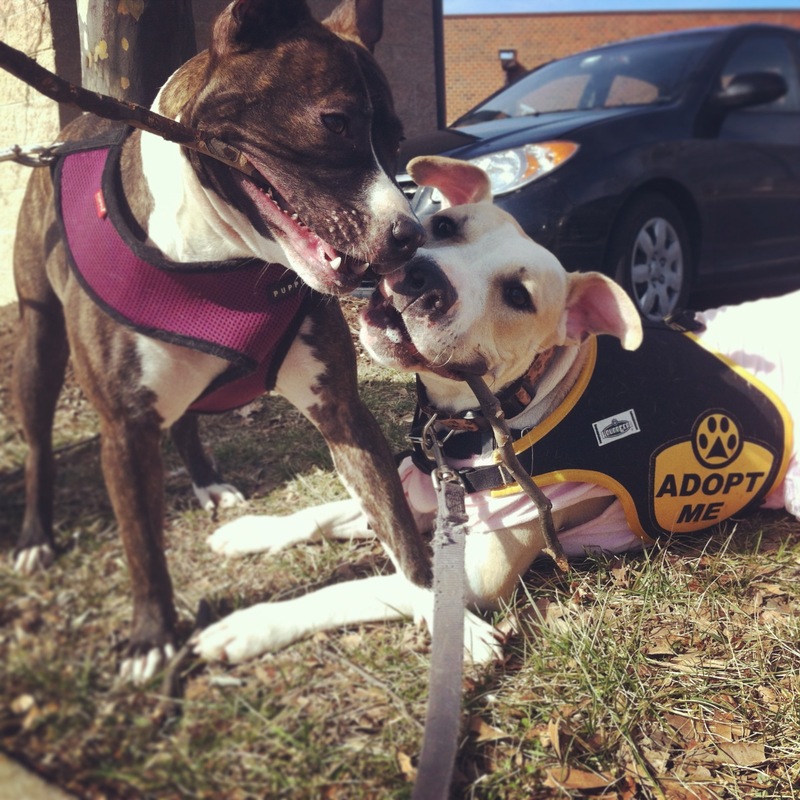 This method is most helpful when we’re on our Pit Crew walks or at adoption events. She does not need it as much when we’re passing dogs on our walks, as long as I make sure our route keeps her below threshold. At events where we’re in closer proximity to other dogs, it is helpful for us if she is continually doing something, whether it’s walking, watching me (our cue is literally “watch me!”), doing touch, etc. – we have found it important to keep her little brain focused on a task so her thoughts do not wander to the other dogs! We also do lots of practice on parallel walks with low key friends that won’t bother Johnnie while she works on her calm and focus skills. Johnnie practices not worrying about the fact that Nicky’s in front of her. She gets rewarded any time she “checks in” with me because it means she’s being super relaxed around Nickster. This past weekend we had a few breakthroughs after many weeks of practicing acknowledging other dogs and staying calm. 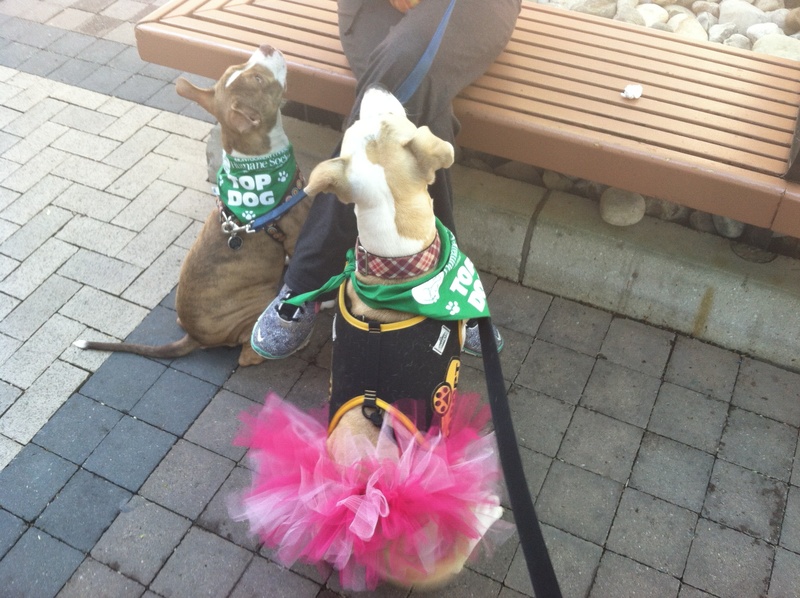 We attended an adoption event in a busy town center. 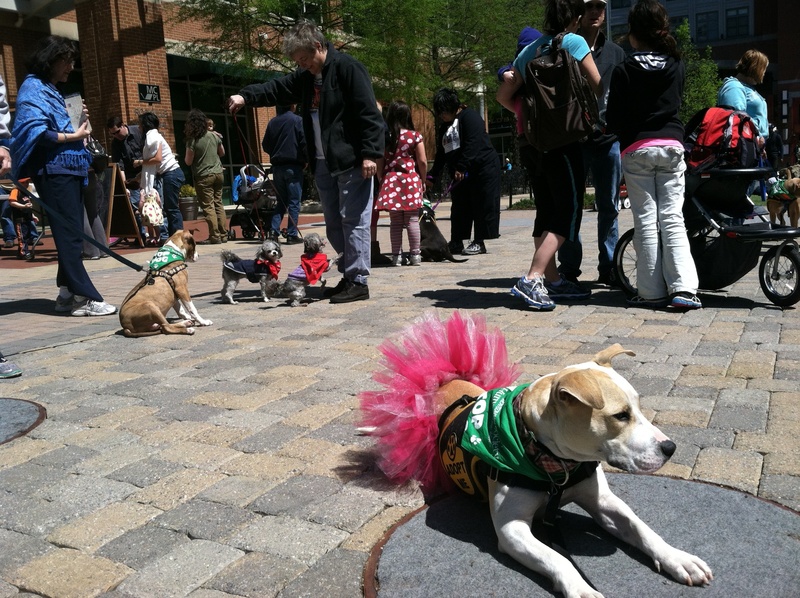 Johnnie was able to be around many other dogs and she did not have one barking melt down! I was sure to constantly keep her focus on me or redirect her with a cue if her eyes started straying, and I was also sure to keep her below her current threshold (which is actually a closer distance than it was four weeks ago – yay!). She made a puppy friend, which is usually easy because puppies are so easy going, but she also met a couple other dogs on a loose leash and was fine with them. Go Johnnie! What I will not do is take this awesome performance and use it as an excuse to say, “Yay! Let’s attend all the doggy social gatherings in the area this summer!” In fact, I’m not sure Johnnie will ever be the type of dog to attend or live somewhere with heavy dog traffic. I think it will always be too much for her, unless her adopter works extremely hard with her to continue improving that emotional response. I’m okay with it because it is who she is, and her adopter will appreciate that just like I do. She might not like every other dog she meets, or she might not like being around a lot of other dogs in a close space – but hey, I’m the same way with humans. I knew that a lot of Johnnie’s barking was probably frustration, so I kept thinking about trying to find her a play date. I know she is an over-zealous player though, so I wasn’t sure who would be a good match for her. Turns out the perfect playmate was an old friend who was just an email away, and we hadn’t even thought about it! Tune in tomorrow to see who Johnnie played with this weekend (who can guess? ), and how it went. To adopt your very own work-in-progress, check out Johnnie Cash’s Adopt Me page. 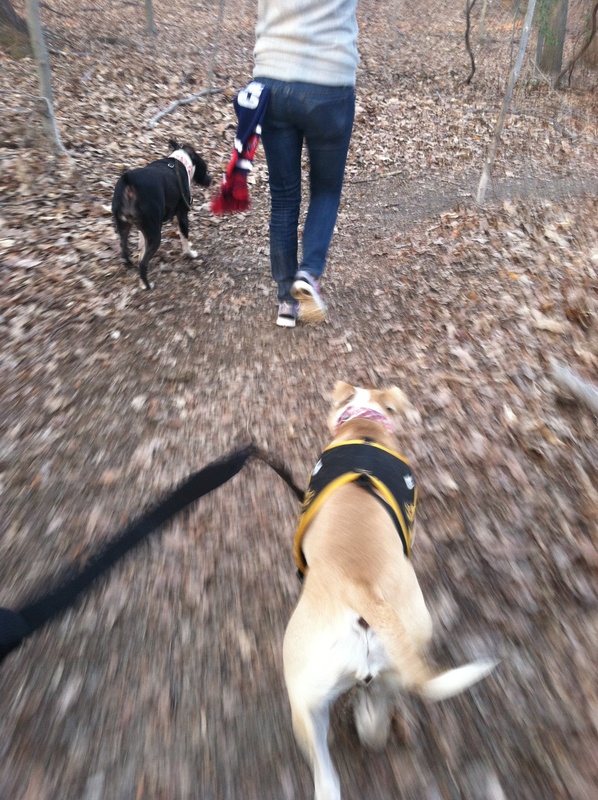 This entry was posted in Dog talk, Johnnie Cash, Pittie Trails, Rescue/Humane Society and tagged behavior modification, clicker training, counter conditioning, dog training, dogs with other dogs, force-free training, foster dog, positive training, reactive dog. Bookmark the permalink. This post was great to read! I adopted a pit bull mix from BARCS last year who is EXTREMELY leash-reactive (due to over-excitement and frustration). She is generally a-ok off leash, and could care less about the dog once she is able to greet it or sniff it, but it’s when she sees them on walks and can’t get to them that she has a full blown melt down. My issue is that NOTHING will distract her from the other dog once she sees it…she becomes so laser-focused on it that she almost turns into a statue. I use the “here!” technique using high-value treats (hot dogs, cheese) to divert her attention away from the dog, but it is like her brain turns off and she can’t even hear me. I’m not sure how to do it so she actually will turn her focus on me when she is that focused on the dog? What I would do – and I’m not a trainer yet, so you might want to consider looking into one to help you as well – is practice focus work below her threshold. Like I mentioned in this post, threshold means the distance where she can still keep her brain around other dogs. Go to a dog park (or any place where you’re guaranteed to see dogs at a controlled distance) and stay far enough away that she can still break her focus from them. In fact, you might want it so that she pretty much doesn’t notice them. You might feel like you are a football field away at first, and that’s okay! Practice “watch me” and “touch” using very yummy treats with the dogs all the way off in the distance. Do this often, and slowly move closer with every visit, being sure to never get too close where she is super-focused again. Hopefully you will find that her threshold distance begins to decrease, and one day she will be able to focus on you at closer distances. Good luck! And, once she gets better at focusing on you during these sessions, you can practice things like having her acknowledging the other dogs and then checking back in with you. This will be very tough for her, so it should only come after lots of practice at far, below threshold distances. Ultimately your goal will be for her to be able to see other dogs and be okay with removing her focus from them. Like I said above, asking a certified trainer for help might also be beneficial! Great piece I find it so fascinating to read about the different levels of dog-dog comfort. Rufus falls between enjoying other dogs but really don’t wanting to make friends with most of them, haha. Ashley, I have the exact same problem…..laser focus on the other dog and it seems nothing can break her eye contact. We generally try to keep her away from events any more, and on walks in different parks I keep an eye ahead to check who is coming, but those who have their animals off-leash blow her calm every time! I would love to have more tricks to break that focus. Yes, same here- Bailey can’t go to any parks where there are a lot of dogs on leash, etc. because she will have an epic meltdown and cause a huge scene. It is difficult b/c we live in the city, so always see dogs while on walks. I duck behind A LOT of cars and hide in alleys if necessary :). She behaves the same way every time — 1) sees dog, freezes in her footsteps. I try to drag her along and make her focus on me but she won’t budge 2) lowers her body towards the ground, stares with laser focus,starts whining very loudly 3) starts to lunge, pull, make high pitched fast bark at dog 4) realizes she can’t get to it, has meltdown, lunging/barking/pulling/whining/flails herself in the air 5) me, embarassed. Hey guys – I responded to Ashley’s comment above. Check it out and see if you find it helpful! One of my girls is like that also, whenever we take them for a walk I am constantly scanning for other dogs and will take them way off the trail so she can not see the other dog and when she does she goes nuts, it is quite embarrassing but I am hoping the more I safely expose her to other dogs and situations she is not use to and reinforce good behavior, the more she will start to relax. She is our youngest at 2 yrs old and thinks she is the protector of the family, especially me, she does not like anyone even hugging me, even her “dad”. I love your attitude towards accepting the fact that Johnnie may never be 100% ok in high traffic areas. I feel the exact same way with one of my dogs that isn’t particularly good with small animals. 99% of the time she is wonderful with everyone, but I am always prepared for that 1% which is totally fine with me. We work on it, but it’s ok if she never completely changes. It’s just who she is! Your post was really helpful. I have a German Shepherd I found as a stray, and his first few months, he was fine. But as he got older and more relaxed, he started exhibiting on-leash anxiety, too. It’s worst at the vet’s office, and it’s gotten to the point where I can no longer sit inside with him because of his lunging, barking, and extremely embarrassing episodes. Isn’t that always fun?! :) He’s not aggressive, but because he’s a large dog, he intimidates a lot of people. He’s great off-leash, and has gotten better on walks, though if I don’t get his attention soon enough, it’s hard to get him to refocus. Even with treats. I have considered using a prong collar, but think I will try a clicker first! Marie Anne – Please do not use a prong collar. You will make the situation worse. He will start to associate the discomfort (pain) of the collar with the other dogs. That’s one of the arguments I’ve heard against them. I know they’re pretty controversial, but I have talked to people who used them with success. Believe me, I am trying everything else, and I would never want to cause my dog pain! Hey Marie Anne – That’s so great that you’ve helped him so much since you found him as a stray! I know reactivity on leash can be frustrating. Check out this post by the rescue group I work with about different walking gear that I think is really helpful in sorting out all your options. http://www.jasmineshouse.org/2013/03/01/walking-your-dog/ Walking gear is actually pretty important when dealing with reactive dogs, and you want to find something that will make both him and you the most comfortable! Also, have you checked out if there are any reactive dog classes in your area that work on counter conditioning and management techniques? I find those really helpful as well. Good luck! Thanks for linking that post, very helpful! After always having non-reactive or even shy dogs, it’s hard to know where to start with a reactive one. I never thought about classes particularly for reactive dogs, but I will do some research and hopefully find one in the area. Thanks again!